It is tough to analyze whether the post 1964 mainstream musicians have chose "the garden" or "the machine" approach to making their music. The "machine" musicians would be the musicians who take advantage of every perk of technology: they are the musicians who overproduce every song, the musicians who auto tune every single vocal, they are the musicians who make sure every song has absolutely no soul, and they are the musicians who think progression is measured in how important they assume their music is. The "garden" musicians would be the musicians who are obsessed with their individual work and the simplicity of that work: their albums seem to have almost no production, all of their work seems to be their own, and their albums seem like they were made during a walk through a garden instead of on some new piece of technology. If these are the definition of "machine" and "garden" albums then you would have to think that most albums today actually do find the middle ground between these two contrasting schools of thought: most modern albums combine the perks of technology with the emotion of the singer and songwriters experiences, opinions, and insights, most modern albums combine a relaxed "walking through the garden" feeling with a "searching Google for the latest news" feeling, and most albums today are not over or under produce but produce enough to where they are the perfect middle ground between the "machine" and "garden" album. After thinking all of this through, I was determined to find an album that was strictly a "machine" or "garden" album and was still really enjoyable. After much searching, I found the perfect "garden" album in Nick Drake's 1970 album titled Bryter Layter. 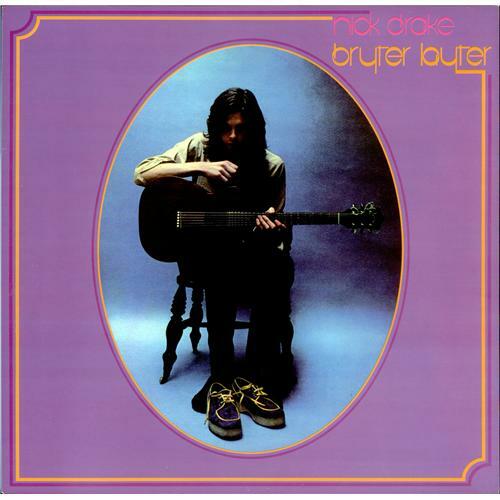 The first thing you will notice about Nick Drake's music and the music on Bryter Layter is how simple and genuine Drake's music seems to be: Drake's music often features just himself and an acoustic guitar, some piano, trumpet, and saxophone, and his almost "whispering soft" vocal style. You would think that all of this forced simplicity would result in an uninteresting and stagnant album, but since Drake has perfected his "garden" approach, Bryter Layter ends up being one of my favorite folk releases I have listened to. Drake's "simple garden" approach works just as well as the "machine" approach because Drake has total knowledge of what he needs to make his perfect garden: his blossoming instrumental flower that is his unbelievable ability to create relaxed atmospheres just by using his acoustic guitar is WAY MORE satisfying then a technologically influenced and overproduced song you might here in a club, the plants of Drake's work are his consistency and his knowledge of his own musical abilities and limitations and this is way more satisfying than a "machine" musician who thinks he has the whole musical world at his keyboards disposal, and the rain which allows Drake's music to grow on the listener is the way his albums flow together and the way they make the listener feel. The primary reason why Drake was a successful "garden" musician and why he was able to make the most uninteresting music so timeless is the flow and general feel of his albums. The "simplicity" and relaxed nature of Drake's sound allows Bryter Layter to sound like a 39 minute and nine second walk in HIS garden instead of a ten track unorganized mess: the way each track leads perfectly into the next track let's the listener go in an almost divine trance of transcendental relaxation, the way every song on here seems so perfectly structured without ever really having a structure (instead of the normal verse-chorus-verse structure, Drake seems to have found his own undefinable way to structure each of his songs to make them all sound breathtakingly beautiful) makes the listener feel extremely comfortable like they are just watering their plants or are watching picking some flowers out of their garden for a loved one, and the warm, soft, and atmospheric vocals combine with the vivid and detailed lyrics allow us not only to embrace Drake's concepts, themes, and instrumentation, but he allows us to become them. Instead of just showing off his beautiful, rich, and relaxing garden to us, Drake allows us to walk in his garden, plant seeds in it, and even take ownership of it. Even when analyzing the tracks individually it is tough to come up with any valid criticisms: "At The Chime of A City Clock" is a borderline sexual folk and jazz fusion track, "Hazey Jane I" is a beautiful almost reggae sounding folk ballad, "Poor Boy" is the most experimental and immediately satisfying track on Bryter Layter, and "Sunday" is a great conclusion to this transcendental, meditative, and beautiful gardening experience. Even though the album is best listened to all together, Drake's Bryter Layter tracks also hold up well individually. They are all beautiful and colorful flowers that help make up the Bryter Layter garden. Even though Marx might have been wrong in his assumption that people are going to either have to chose between the "machine" and "garden" lifestyle, Bryter Layter is 40 minutes of proof of how satisfying the "garden" experience can be in small doses. And when you listen to Drake's garden experience that is so atmospheric, relaxing, effective, and free flowing, you almost never want to go back to a "machine" lifestyle. Drake not only creates one of the most beautiful folk albums you will probably ever hear, but he creates an experience that allows you to forget everything except how to reflect, relax, and maybe even water some of the plants in your garden. The only thought you are left with after Bryter Layter is a morbid and sad one: "what would Drake's career had been like if he hadn't decided to stop watering his plants?"